New Mexico Gov. Bill Richardson says he has declined to issue a pardon to Old West outlaw Billy the Kid, who died in 1881. The prospect of a pardon for the notorious frontier figure had drawn international attention. The issue centers on whether Billy the Kid had been promised a pardon from New Mexico’s territorial governor in return for testimony in killings he had witnessed. Richardson made the announcement Friday on ABC’s "Good Morning America." The proposed pardon covers the 1878 killing of a county sheriff. 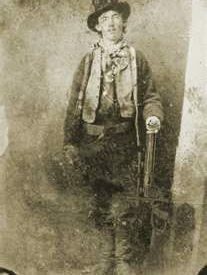 Billy the Kid was shot to death in 1881, a few months after escaping from the jail where he was awaiting hanging for the sheriff’s death.